500 hp turbo engine provides all the speed you need. 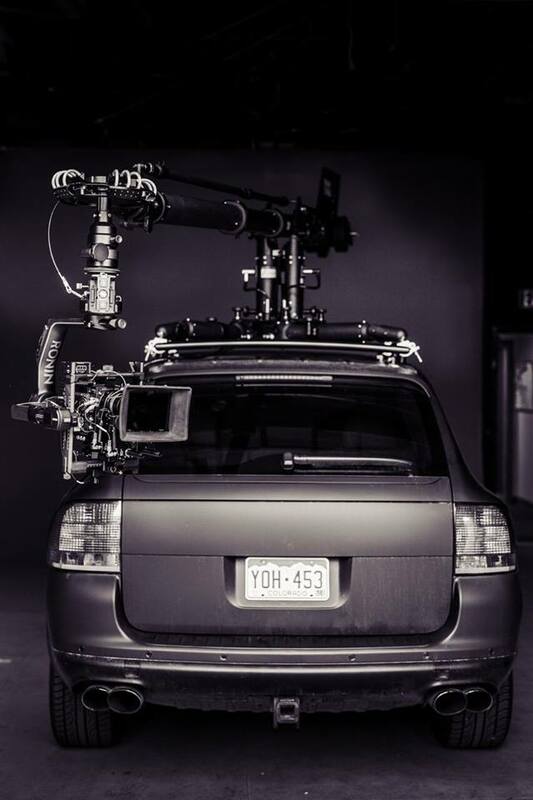 Our vehicles come equipped with gimbal and jib arm remote controls, remote start/stop, interior monitors, wireless video, and communication headsets. Wrapped in anti-reflective matte black, with custom racks and multiple mount points. 12’ arm, 55 lb. payload, 360° swing. Movi XL gimbal comes standard. Other gimbals (Newton, Shotover) available. 9’ arm, 35 lb. payload, 360° swing. Ronin 2 gimbal comes standard. Fixed rear- or front-mounted 8’ jib, 35 lb. payload. Ronin 2 gimbal comes standard. The Black Arm is a fixed arm and can be mounted to either the front or the rear of our vehicles. Can be mounted as a 2nd camera for use with the Classic or the Versa, for seamless inter-cutting. The Black Arm is an industry standard for stabilizing from a boat, snowcat, ATV or any other vehicle, We can rig it for any situations. 3. SAVE TIME, SAVE MONEY by bundling ADDITIONAL services. A variety of camera packages and lenses are available. Our licensed, Part 107 drone operators fly Inspire 2 drones, dual operator with X5S cameras and RAW license. Heavy-lift services for your camera of choice are also available. Our 18.5 foot jib can be used indoors or outdoors, stationary or on dolly track. Our jib team specializes in fast, efficient set-ups. Chris De la Garza has been in film and television for 14 years. Growing up in the Colorado ski town of Steamboat Springs he was behind the camera early in life. His weekends were best spent shooting ski films with his friends on his mothers Hi-8 video camera. After serving 5 years in the Navy as an Aircrewman, Chris focused on his true passion, cinematography and directing. Living and working in Los Angeles taught him what it takes to work and succeed in this business. Moving back to Colorado grounded him. Chris has spent his career as a director of photography shooting in difficult and challenging environments. 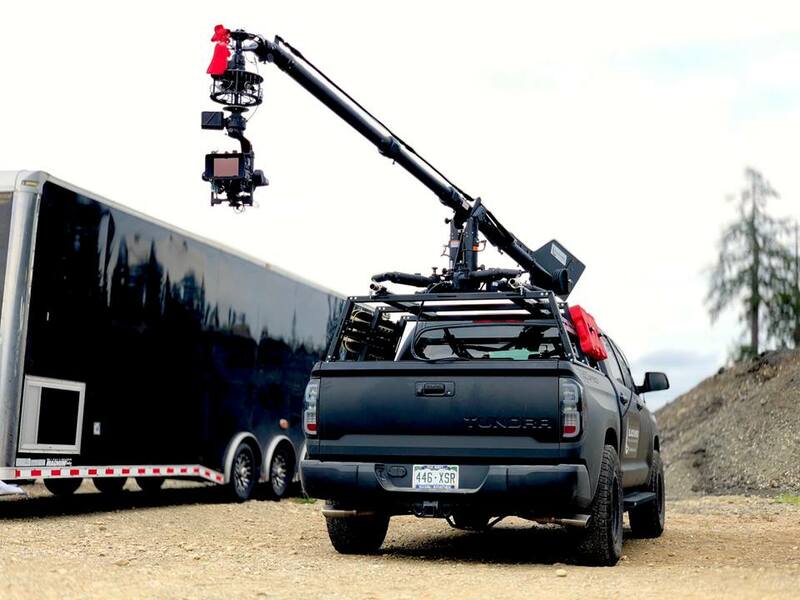 Whether atop a peak in Alaska with NatGeo, in the desert with History Channel or chasing a car through turn 4 of an oval racetrack with the Discovery Channel, Chris always wants to find a way to get that unattainable shot. Chris will go from piloting a drone shot, shooting a car-to-car-sequence from a Black Arm, to shooting story on his MoVI Pro, all in a days’ work. This has led to him being asked to create looks for TV pilots and first seasons of many shows for majors networks. 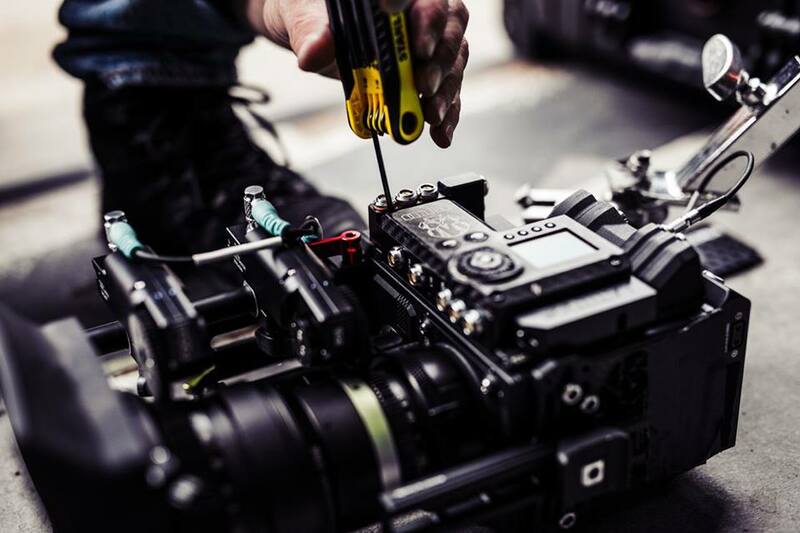 Chris recently wrapped Season 1 of Aaron Kaufman's popular Discovery Channel show, Shifting Gears, where he was the Director of Photography. Chris is Blackwing's primary driver. Jon Firestone is our technology guru, with a reputation for early adoption of cutting-edge camera and stabilization systems. In 2001, Jon purchased Sony’s first professional high definition camera, the HDW-700, then became one of the early adopters of RED cameras. Jon bought into the original MōVI M10 gimbal from Freefly Systems and got hooked on electronically stabilized gimbals. It changed his shooting style. He rarely takes his camera off a gimbal, generally shooting handheld with the MōVI or on a jib. 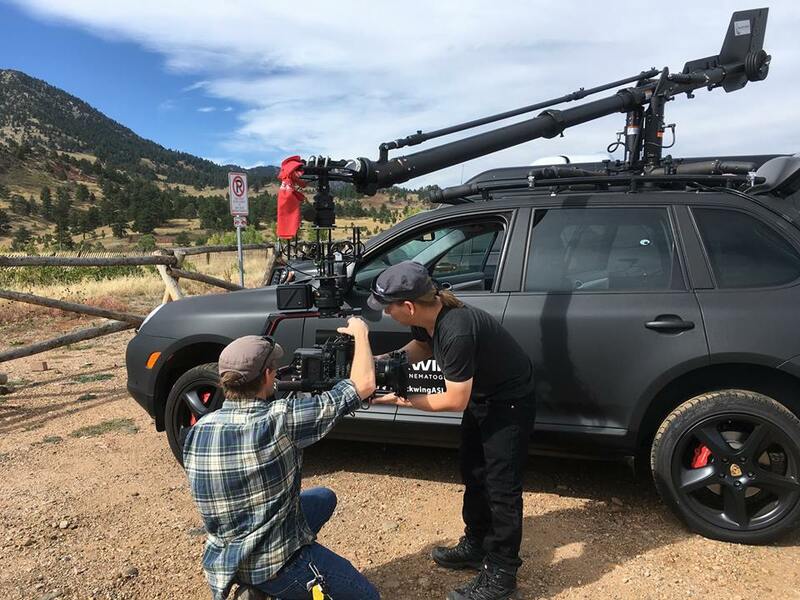 He has worked on many of Colorado’s largest commercial shoots, such as Kia, Jeep, Dodge, and Aston-Martin. He is also a DP for Furniture Row and travels the globe as a DP for Westin Hotels with Jason Dewey Photography. He has operated camera on aerials for Chevy, Aspen Tourism, and National Geographic. He is a licensed drone operator, with his Part 107. Jon has shot eight feature films and taught animation for three years in a program which he helped to pioneer at the Colorado Film School. Jon is the Blackwing ASL Director of Photography and also works as primary remote head operator for the gimbal. Meryem Ersoz is one of Colorado's top film producers. She has produced feature films in budgets ranging from $200,000 to $3 million. Under her commercial production label, Red Pine Studios, Meryem also provided all of the local Colorado production services for the feature film, DEAR ELEANOR, directed by Kevin Connolly. In addition to producing features, she also works as a cinematographer and digital imaging technician in the documentary and commercial worlds, working for clients as diverse as Discovery Channel, NOVA, Nat Geo, PBS, CNN, Vice, Red Rocks Amphitheatre, Audi/Ducati, dish Network, Comcast Entertainment Channel, Wendy’s, Comcast, Conoco, Chevy, Furniture Row, Boulder Neurosurgical Associates, and others. Meryem is the only high-end producer in Colorado who also has her own cinematography reel, which gives her a unique grasp of not only the technical and creative arts, but also of the logistical and financial aspects of production. As its producer, Meryem runs operations for Blackwing ASL, while also operating the crane and driving the Porsche.